The body can absorb 600% to 1,000% more contamination in a single ten-minute shower than drinking the same tap water for an entire day. Have you noticed how dry your skin is after your shower and the negative effect it has on your hair? The chlorine in your water is designed to attack living organic matter and we are all living organic matter! Removes chlorine which is a bleaching and drying agent. Eliminates unpleasant odors from your water. Reduces skin dryness, flakiness and rashes. Easy Backwash System for lasting performance. Chlorine is the most commonly used disinfectant in public water supplies across the globe. It is used because of its effectiveness at eliminating viruses, bacteria, and other micro-organisms that can lead to various waterborne illnesses and death. Unfortunately, drinking water with high levels of Chlorine can be harmful to your health. What many people don't know is that showering in chlorinated tap water can cause you to absorb, through inhalation and skin absorption, up to 100 times more contaminants than simply drinking that same water. Aside from these health risks, showering or bathing in chlorinated water can cause skin and hair dryness, irritation or even dermatitis. The Naturally Filtered Long-Life Shower System is the best performing NSF Certified shower filter. Most shower filters reduce less than 90% of Chlorine initially, and quickly drop off to 50 - 60% reduction. That's leaving half the Chlorine in your water! Even at the end of its cartridge life the Natural Shower continues to reduce more than 89% of Chlorine. The Naturally Filtered Long-Life Shower System also offers industry leading performance in sediment heavy waters. The patented KDF chamber was designed in collaboration with KDF Labs and allows the Natural Shower to perform in problem water areas where other showers clog up in days or weeks. The Naturally Filtered Long-Life Shower System is sleek in its design and comes with a chrome and gold plated deluxe shower massage head. This head will produce several different types of sprays including one for those tired aching muscles. The head may be removed for any other hand-held shower wands. The new filter comes in an appealing white color. 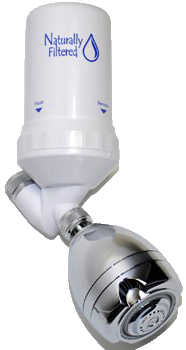 The Naturally Filtered Long-Life Shower Filter has been on the market since 1998 and tens of thousands of units have been sold. Where other shower filters arrive defective or fail prematurely, the Naturally Filtered Long-Life Shower Filter continues to perform every day. 1. 50 Micron Filter Pad - Before entering the KDF chamber water first passes through a 50 Micron polypropylene filter pad. This pad blocks sediments and other debris and is cleaned through the patented backwash feature. 2. KDF Media - KDF is a copper and zinc alloy designed to break down Chlorine into harmless Chloride. It is bacteriostatic and works best at high temperatures with minimal contact time, making it the ideal shower filtration media. Every NSF Certified shower filter uses KDF. 3. As water enters the KDF Chamber it lifts the KDF through a choke point creating a venturi effect. This effect spins the KDF, cleaning off accumulated debris and fully coating the polypropylene cylinder. This patented chamber is why the Natural Shower reduces more Chlorine for longer than any other shower filter on the market. 4. Water passes through the polypropylene cylinder and exits through outer channels around the KDF chamber on its way to the shower head. During backwash the polypropylene cylinder prevents sediment from getting into the KDF Chamber. 1. While testing was performed under standard lab conditions, actual performance may vary. 2. Do not use with water that is microbiologically unsafe or of unknown quality without adequate disinfection. 3. Filter life will vary in proportion to the amount of water used and the level of impurities in the water being processed. For optimum performance, it is essential that the filter be replaced on a regularly scheduled basis as follows: (a) every 12 months; (b) every 15,000 gallons; (c) when the flow rate diminishes. 4. The Natural Shower is warranted as follows: All parts, workmanship and materials - 1 year. Please see the Owner’s Manual for complete product guarantee and warranty information. 5. Please see the Owner’s Manual for installation instructions and operating procedures. 6. Check for compliance with state and local laws and regulations. Trademark Notice: Aquasana, Sprite, and Rainshow'r are trademarked property of their respective companies and included under fair use for comparison purposes only. Why should I use a filter in my shower? Chlorine is the most commonly used disinfectant in public water supplies across the globe. It is used because of its effectiveness at eliminating viruses, bacteria, and other micro-organisms that can lead to various waterborne illnesses and death. Unfortunately, drinking water with high levels of Chlorine can be harmful to your health1. What many people don't know is that showering in chlorinated tap water can cause you to absorb, through inhalation and skin absorption, up to 100 times more contaminants than simply drinking that same water. Aside from these health risks, showering or bathing in chlorinated water can cause skin and hair dryness, irritation or even dermatitis. Besides Chlorine, what other chemicals does the Natural Shower reduce? The only contaminant any shower filter has been certified to reduce is Chlorine. Many companies selling shower filters without certification or performance data claim that they remove or reduce various chemicals but they will not provide 3rd party testing data to validate those claims. While some reduction of other contaminants is possible, the contact time (amount of media compared to the flow of the water) is very low in a shower filter compared to a kitchen filter and the only thing that can be effectively reduced is Chlorine. By effectively reducing the Chlorine before it exits the shower and reacts with the air and your skin, you are also reducing the production of Chlorine Byproducts (Trihalomethanes or THMs) such as Chloroform which can be hazardous in the shower. How does the Natural Shower compare to the other shower filters? The Natural Shower is the best performing NSF Certified shower filter. Most shower filters reduce less than 90% of Chlorine initially, and quickly drop off to 50 - 60% reduction. That's leaving half the Chlorine in your water! The Natural Shower reduces greater than 98% of Chlorine after 9,000 gallons and still reduces more than 89% of the Chlorine at the end of its cartridge life. The Natural Shower also offers industry leading performance in sediment heavy waters. The patented KDF chamber was designed in collaboration with KDF Labs and allows the Natural Shower to perform in problem water areas where other showers clog up in days or weeks. Does the Natural Shower reduce Chloramines? We have tested our Natural Shower internally and it can reduce up to 60% of Chloramines. There is simply not enough contact time to offer a high level of reduction. Our drinking and home systems both reduce Chloramines effectively. If you find a company claiming that their shower filter effectively reduces or removes Chloramines, you should check their test data to validate the claim. We have not seen any reputable data showing a shower filter that effectively reduces Chloramines. Can I use a Hand-held Shower Wand with my Natural Shower? You can use any US Standard shower head with the Natural Shower, including most hand-held shower wands. The Natural Shower is attached directly to the 1/2 Inch male pipe fitting in your shower. It comes with a massage shower head that can be removed to expose a 1/2 Inch male pipe fitting that any standard shower head can be connected to. Does the Natural Shower Cartridge fit in my old Wellness Shower base? The Natural Shower cartridge fits in the black Wellness Shower base, as they are produced from the same mold. Your filtration performance will be identical, filter life is the same, and the backwashing feature is the same in both units. We produced the Wellness Shower for Wellness and it is just an extended cartridge made from our standard molding used for the Natural Shower. We extended the cartridge for their unit to add their Japanese stones and magnets, which did not affect the filtration performance of the unit. We discontinued the Wellness Shower model When Wellness Filter closed in July 2010 as they were unable to validate the value of their media and we did not feel it was worth the $100 price increase on both unit and cartridge. My Natural Shower is leaking. Leaks from shower pipe connection - This occurs when the rubber gasket is not achieving a proper seal against the end of the shower pipe. Unscrew the leaky connection and inspect the rubber gasket and the shower pipe for damage. If the end of the shower pipe is damaged, you can use a metal file to smooth the surface of the shower pipe end. If there is damage to the pipe threading you can add Teflon tape to help achieve a better seal. If the rubber gasket is damaged (this can happen if you over-tighten the connection) you may need to replace it. Leaks from Backwash Holes on base - Water should not be leaking from the two backwash holes on the base of the unit during normal service operation. The most common cause of this problem is that the cartridge is not seated properly on the base. This can be fixed by unscrewing the locking ring and re-tightening the cartridge onto the base as described in the cartridge change section of the Natural Shower manual that comes with the filter. Pay particular attention to step 4 of the instructions as it is possible that one of your rubber gaskets is missing, improperly seated, or damaged. If you have a missing or damaged rubber gasket please contact us for a replacement part. There is something brown / black coming out of my shower head. Please contact us if you have physical particulates coming from your shower head. It is likely that you will need to replace your cartridge. If your cartridge is less than 6 months old you may be eligible for a credit towards your next cartridge. The most common cause of particulates exiting the shower head is that your shower filter has been overwhelmed by sediment. 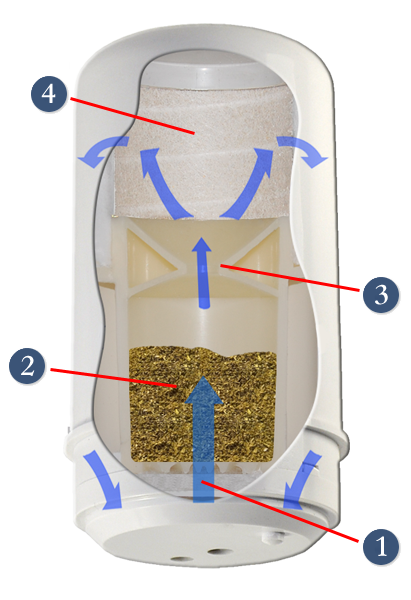 The Natural Shower has a unique backwash feature that allows you to easily purge sediments that can build up in the unit over time. If the water in your area has extremely high sediments you can backwash the unit daily for 30 seconds to maximize the effective life of the filter. Even with regular backwashing, some sediments can stick inside the filter chamber and shorten the life of your system.